It is 4 PM Bangkok time. I am forcing myself to document the day despite the travel grogginess. After a 12 hour flight to Beijing and a 5 hour ride to Bangkok and at least six hours of airport sitting time, we were treated to Thai immigration and baggage claim. Our tour guide and bus were there and after a 45 minute ride, we reached our hotel. We were in bed by 4 AM local time. We rose at 7 for breakfast. Then we started our day. 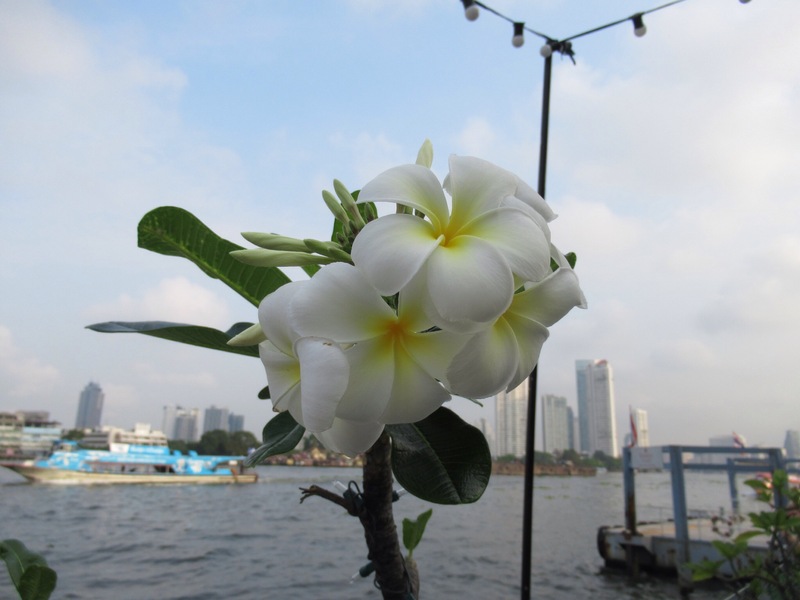 We enjoyed breakfast on a terrace overlooking the Chao Phraya River. Out guide describes it as the Thai Mississippi. That would make Bangkok the Thai New Orleans. Out hotel room is very elegant despite some aging of the teak woodwork. I am not complaining. The bed is good even though I could fall asleep on nails. The AC works and that is good since it cools to 80 at night from the 90 plus in the day. It is the middle of the Thai winter and I am happy to miss the hot seasons. By the way, our breakfast included everything imaginable included at least 50 types of noodle dishes and I only had room for one. Plenty of coffee to get going. Our vivacious guide Susie got us on the bus and reviewed essential Thai etiquette and we were off. I quickly realized that I was glad not to be driving. Not as bad a Cairo but worse than Athens. The street scene is everything you could wish for or at least what appeals to me. Endless street vendors, Tuk Tuk cabs, giant trucks and any possible wheeled conveyance and brave pedestrians. We were issued our water rations and enjoyed the ride to our first stop, the Golden Buddha Wat or temple. Teachable moment. 95 % of Thai people are practicing Buddhists. There is a smattering of others including Christians and Muslims, but Buddha is everywhere. The 2 ton, solid gold Buddha sits in his own elevated temple. The 90 stairs up wasn’t bad. The Buddha statue wasn’t artistically much. The statues are stylized and my understanding of the iconography is limited. Buddha is not a god but teaches a methodology to reach the goal of Nirvana. This goal of peace and removal of earthly pain can be achieved by following Buddha’s path. The 400 Wats or temples in Bangkok provide plenty Buddhas to go around. Those seeking enlightenment have plenty of options. After using the pleasant “Happy Rooms” or public restrooms we managed to find some snacks for later and avoided the temptation to buy elephant pants. There were tout groups that adopted the baggy elephant pants as their uniform. We will have to see what appeals to the 19 people in our tour. Next stop was the marble temple Buddha. 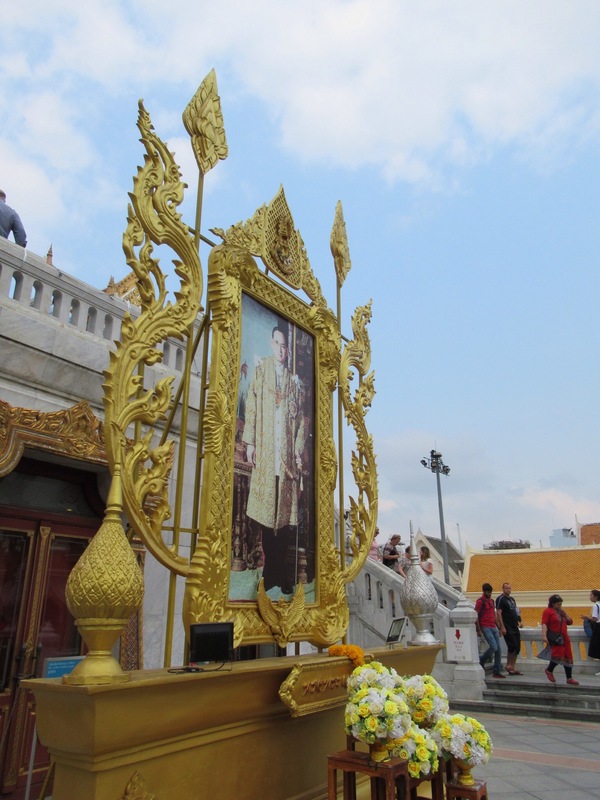 The most interesting part was early 20th Century Thai King who loved all things Italian. The temple was built of Carrera marble and designed by Italian architects. The temple bridges sported cast iron produced in Italy. The palace used Italian motifs. There was still a place for plenty of Buddhas. Despite feeling done with Buddhas, we had the grand finale. The reclining Buddha is 150 long and 50 feet high. It is basically brick and plaster but covered with gold leaf. It was impressive because of size but little else. What was more interesting were the huge complex of stupas on the temple grounds. The stupas hold cremated remains of the faithful. The pictures give a good idea of the Watts Tower-Gaudiesque nature of the place. They made for a quite remarkable graveyard. Thankfully, we were done with Buddhas for the day. We were hungry and we bought some street food. There was a guy doing deep fried chicken on the sidewalk. We went for it and it was really good. We will see tonight. We then boarded out canal boat for a 2 hour romp through the Bangkok canals. We dodged six foot monitor lizards that live amongst the house pilins and hundreds of long tailed boats that careen through the canals. James Bond developed some ability with these crazy vessels. Our boat was tame by comparison. We managed to tour the royal barge collection. Yul Brynner was no where to be found. We finally made it back to our hotel and are prepping for our Welcome Dinner and then a visit to the night market. That will be the end of our first day. Great post! So, did you and Peggy buy a gold-toned Budda keychain? Get some sleep! Keep up your strength for trolling for street food.